We have established ourselves as a renowned organization engaged in offering an eye-catching collection of Orange Floor Cushions. 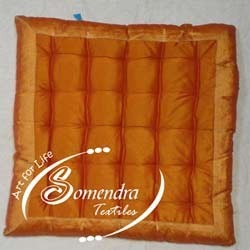 Designed by the experienced designers, these cushions are developed in adherence with the prevailing market trends. Owing to their features like classy look, vibrant colors and intricate patterns, these cushions are widely demanded by the clients. Available in vibrant shades of orange, the range can also be customized as per the requirements of the customers. Annual Turnover2011-12 Rs. 50 Lakh - 1 Crore Approx. Somendra Textiles take pride in introducing ourselves as a leading organization, engaged in manufacturing of exclusive collection of Home Furnishing and Textile Products. With our expertise in the Textile Industry, we are able to design and develop an Exquisite collection of Soft Home Furnishing items, which is appreciated by our clients across the nation and worldwide. Our range include Bed sheets, Bed covers, Curtains, Quilts, Table & Bed Runners, Place mats, Napkins, Table Covers & more. Our quality standards have enabled us to offer products that possess features like Proper sizing, Quality stitching, Long life durability.Owing to these features we are able to satisfy the needs of our clients in a best possible way. "We are a leading Manufacturer & Exporter Of Home Furnishing and Textile Products and many more items from India & are mainly looking for Export Enquiries "